Thanks to fellow blogger Philalethes of Bouphonia, here is a link to a fine analysis of the Millenium Ecosystem Assessment which discusses four scenarios of the future. Good reading. Japan's National Science Museum and Toshiba Corporation today announced that they have solved a long standing mystery by reconstructing the "man-nen dokei," literally a clock that works for tens of thousands of years. 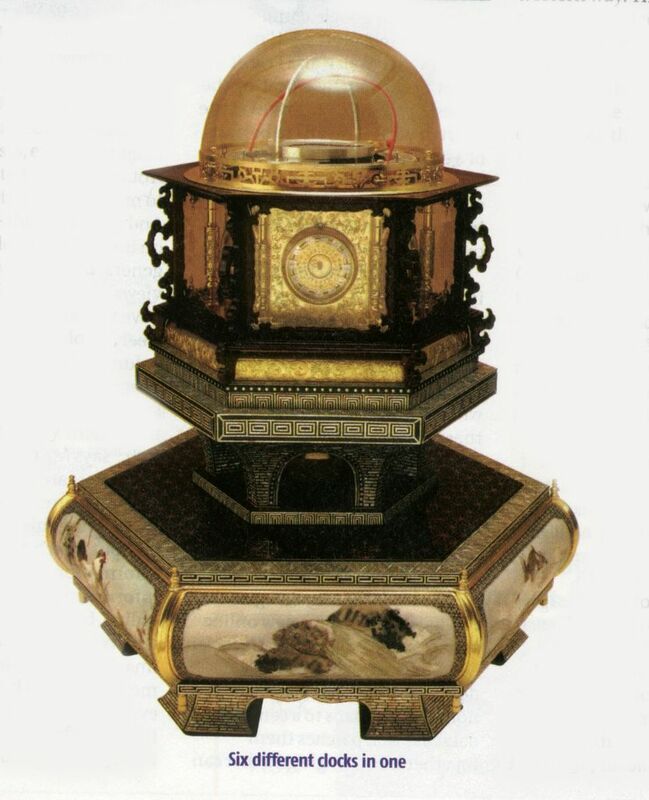 The ornate, incredibly complex six-faced chronometer was created by Hisashige Tanaka, the founder of Toshiba, in 1851. A team of researchers, engineers and specialists drawn from diverse fields painstakingly disassembled the original chronometer, studied its intricate mechanisms, and crafted a working replica that will go on display at Expo 2005 in Aichi, Japan. The delicate structure of the original "man-nen dokei" has long made it an object of fascination, an interest stimulated by the silence of the original. The clock has been investigated before, but not in enough depth to unravel the secrets of its clockwork mechanism and how Tanaka integrated such complexity—or if it really could run for a year on a single winding. Just 24 inches tall, and weighing 83 and 3/4 pounds, the chronometer has six faces, each of which presented the passage of time in a different way: a standard western clock; the phases of the moon; the oriental zodiac; Japan's ancient 24-phase division of the lunar year; the days of the week; and the passage of the day in the old Japanese way, dividing the hours of dark and light into six equal parts. The chronometer also chimed to mark the passing of each part of the day. Despite the extraordinary complexity of this design, the clock was reputedly designed to operate for a whole year on only a single winding. Toshiba, the owner of the "man-nen dokei" agreed to work with the National Science Museum to investigate this mystery, and the project also won support from a Ministry of Education, Culture, Sports, Science and Technology national program to investigate inventions of the Edo age. In the course of a yearlong investigation, the research team carefully dismantled the chronometer, investigated its mechanisms, and successfully reproduced them. The study confirmed that the chronometer actually worked, and could do so for a year on one winding. The replica of the clock was reactivated, when Mr. Tadashi Okamura, President and CEO of Toshiba, and Mr. Masamine Sasaki, Director General of National Science Museum together wound up the clockwork mechanism and ended 154 years of silence. 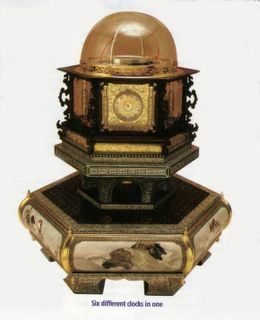 The intricacy of Tanaka's masterpiece was complemented by its exquisite exterior: features that included a carved wooden base, cloisonne enameling, fine metal reliefs and delicate filigree work transformed a scientific marvel into a work of art, finished with the crowning glory of a representation of the orbits of the sun and the moon within a glass dome. All of these features have been recreated by modern craftsmen of Japanese traditional art, who confirmed the excellence of the original work. I found a small piece on this clock in the March 19-25 issue of New Scientist magazine and it fascinated me immediately not only for the mechanical sophistication it must require but also because i know that there is a group in this country called the Long Now Foundation working on a ten thousand year clock. i heard of the Long Now foundation several years ago because Stewart Brand, editor of the Whole Earth Catalog from 1968 to 1971, is involved and i try to keep up with his endeavors. 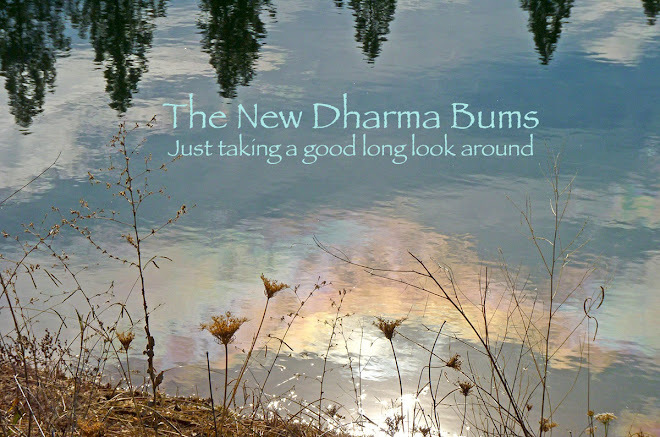 The Dharma Bums have not commented on the spectacle of Terri Schiavo's last days. We have felt that this case was nothing more than a family feud played out on the national stage. We didn't think it was a Right to Die case, as the courts always agreed she had that right. It was a horrible battle between her parents and her husband, not one that can be easily extrapolated to other cases. The wingnuts' involvement merely extended the spectacle into the streets, offering sobering glimpses into their fear of death. We hope Ms. Schiavo can finally rest in peace. A landmark study released today reveals that approximately 60 percent of the ecosystem services that support life on Earth – such as fresh water, capture fisheries, air and water regulation, and the regulation of regional climate, natural hazards and pests – are being degraded or used unsustainably. Scientists warn that the harmful consequences of this degradation could grow significantly worse in the next 50 years. Please continue reading this report. After reading about the current status of freshwater, it occurred to us that there was an ancient and reliable source of water collection that we should consider for at least our garden irrigation. 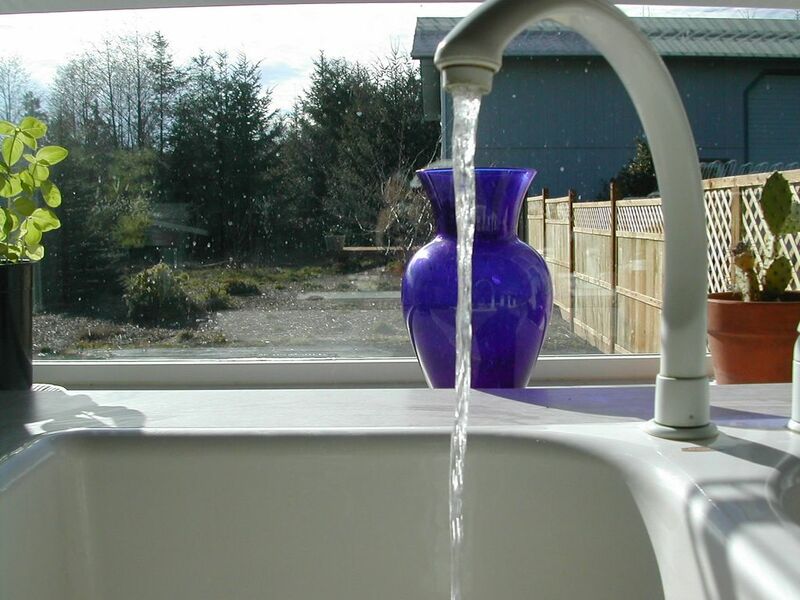 Rainwater catchment systems are used in more than two million households worldwide and in more than 250,000 in the United States. It really is quite a simple concept. 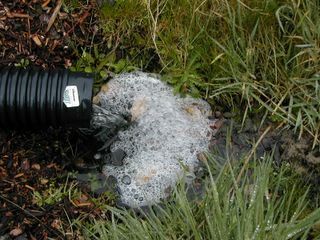 For households in areas that are wet throughout the year, rainwater catchment can be used to either supplement the well or community water source, or can be a stand alone system; for those who live in low rainfall areas, water is collected during the rainy, wet season and used during the dry and drought periods for landscape irrigation. Rainwater is captured in runoff from roof gutters and by gravity flows into holding tanks. An inch of rainfall can produce 600 gallons of water per 1000 sq.ft of catchment area (the size of the roof that feeds the gutters). It rained today. 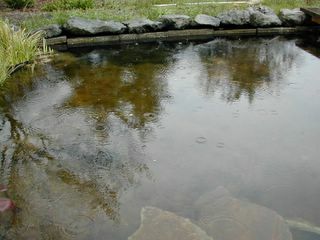 We watched the water fill our little pond and run off our gutters into the ground. Maybe by the next big rainfall, we'll have system set up that would have captured that precious resource and saved it for July when we'll really need it. 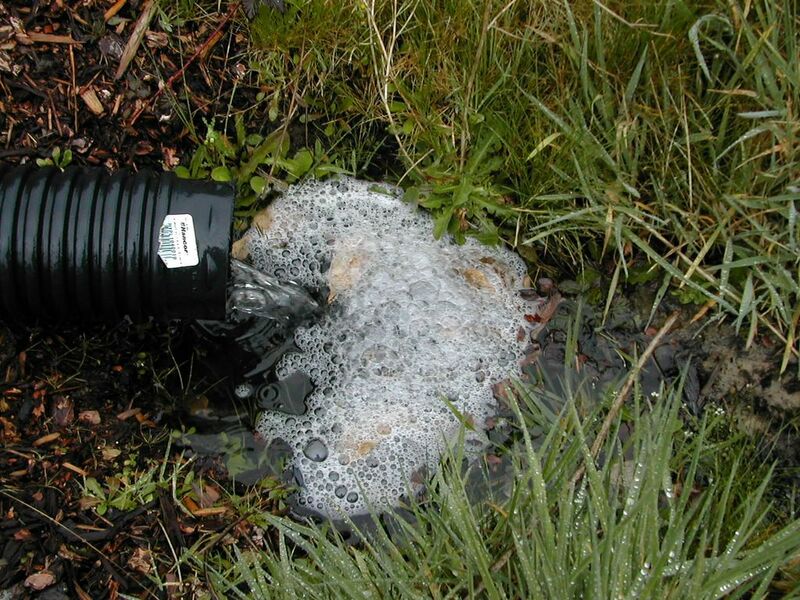 For more information about rainwater catchment. It is always so interesting to watch the how the brain works. To see the spark in a conversation lead to a train of thought, a connection, a memory of something once forgotten, an idea. We were talking about birds and nests. I had just read an article that said how little research had been done on nest-building. We wondered and mused about how and where different birds build their nests. We've been watching the daily labors of a pair of house finches build a nest in one of our spruces. The dread pirate said that he thought some shore birds, or birds of the tundra just lay their eggs on the ground. And that made me think of emperor penguins and where they lay their eggs. Thinking about the emperor penguin reminded me how fascinatingly weird they look, the way they stand like fanatic sentries, with their elegant tuxedo markings and bizarre little wings that don't enable them to fly. How they seem more like a cross between a seal and a bird, not really bird-like at all. I thought, the only thing that could make them any weirder would be if they were a marsupial. The absurd idea of a marsupial bird reminded me of a photograph I had seen once of the last surviving marsupial wolf. I hadn't thought about that photograph for over twenty years. So, I flipped open the laptop, googled marsupial wolf, and there it was: The wolf with a pouch. Hunted to extinction in the mid 1900s, the marsupial wolf (thylacine) was once called Tasmanian wolf, marsupial dog, zebra dog, and opossum hyena. It was given these names because of its superficial resemblance to placental canids. The shape of the thylacine's head, especially the morphology of the skull, and the elongated body with its long tail and the structure and position of its legs are very wolf-like, but its legs are proportionately shorter, its feet are bear blunt, and have non-retractile claws. So what exactly was this creature? The phylogenetic position of the recently extinct marsupial 'wolf', or thylacine (Thylacinus cynocephalus), has been a source of contention in mammalian systematics for nearly a century. Thylacines were endemic to Australasia, but possessed striking anatomical similarities to Oligo-Miocene borhyaenid marsupials of South America. At issue has been whether these features are indicative of common ancestry or convergent adaptation to carnivory. Recent morphological studies have supported both conclusions. Although current marsupial classifications group thylacines with Australian dasyuromorphians, this putative clade is characterized by mostly primitive morphological features. Attempts to determine thylacine affinities with ancient protein and DNA analyses have supported, but not resolved, a dasyuromorphian placement. We report 1546 bp of mitochondrial DNA sequence (from cytochrome b and 12S rRNA genes) and 841 bp of nuclear protamine gene sequence from the thylacine and representatives of all or most other marsupial orders. Phylogenetic analysis of these sequences shows unambiguously that thylacines are members of Dasyuromorphia, and suggests a late Oligocene or very early Miocene divergence of familial lineages. (Krajewski C. Buckley, L, Westerman, M. "DNA phylogeny of the marsupial wolf resolved." Department of Zoology, Southern Illinois University, Carbondale 62901-6501, USA). Or, as one other study succinctly concluded, "... the marsupial wolf was more closely related to other Australian marsupial carnivores than to those of South America. Thus, the marsupial wolf represents an example of convergent morphological evolution to South American carnivorous marsupials as well as to true wolves." So, marsupial wolves are not very closely related to placental wolves at all, but so beautifully illustrate an evolutionary concept. I remember looking at the photograph that identified a lonely looking creature as the "last marsupial wolf" and it stayed with me for twenty years. 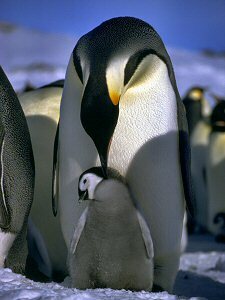 About those emperor penguins, while they are not marsupial, the female does place the egg on the male's feet, which he covers with a fold of skin called a brood patch, and protects it while she can spend weeks in the water hunting for food. The house finch will lay its 4-5 light blue eggs in a nest cup. We should see the nestlings in about two weeks. i try to keep up with science news. there are many interesting and informative sources on the internet. most are not intentionally political but some stories involving science have a major political component. i recently read a small piece about Iraqi farmers being forbidden, by special order 81 decreed by L Paul Bremer as head of the Coalition Provisional Authority, to save seeds from their crops to replant the following season. the reason cited is to modernize iraqi agriculture and move it into the global market economy by protecting the patents of major agribiz seed companies. order 81 is available on the internet and you can read it, as did i. warning!!! lawyers, of course, wrote it. some of them (surprise) worked for major us agribiz companies (Cargill's Dan Amstutz, who may not be a lawyer, was appointed by US Secretary of Agriculture Anne Veneman, formerly of Cargill, to head the Iraq's agriculture reconstruction). include the following acts of third parties for personal non-commercial purposes, for purposes of experimentation or education of new varieties. well. so only patented plant varieties are protected thusly. but wait. elsewhere the order says that ANY plant variety can be patented. how many Iraqi farmers will want to patent their crops? so agribiz can file for patents on any and all heritage varieties of any food crop, or indeed, any plant. you, by the way, contain patented genes in your dna, because this patenting of life extends to animals too. how long will it be til humans must pay monsanto to use our own seed? i found many articles on this subject by searching the internet for "special order 81" or "Iraqi farmers save seeds" or some variant. the following excerpt is from the one that seemed the most balanced and informative. Strictly, the new law does not prohibit the saving of seed from the harvesting of traditional or long-established varieties that are deemed to be "matters of common knowledge." (2) (4) But with Iraqi agriculture in a state of crisis, there are critical seed shortages, and as mentioned above the "reconstruction" of the food supply system involves a substantial involvement on the part of USAID and other food donor organizations. "High quality seed" (whatever that means) is being given to farmers along with technical advice; it is inevitable that that seed comes from US registered varieties, and that within a year or two philanthropy will be replaced by the collection of seed royalties. In addition, careful digging reveals that Order 81 allows plant breeders to claim ownership of old varieties (and to call them "new" varieties) if they are the first to describe or characterize them. They can also then claim the ownership of related crops if they are "not clearly distinguishable from the protected varieties." The control of all protected varieties will last 20 years for field crops and 25 years for trees and vines. Farmers who do save seed or otherwise break their agreements, and farmers unlucky enough to find the adventitious presence of "registered varieties" in their fields, can be prosecuted, or else their harvests, tools and buildings destroyed. Conversely, farmers will have no right to claim compensation from the seed owners who, for example, allow their GM crops to pollute organic cropping enterprises and destroy livelihoods in the process. of what possible benefit is it to Iraqi agriculture to enable me to patent a strain of wheat grown there and force farmers, perhaps using US military might, to pay me? 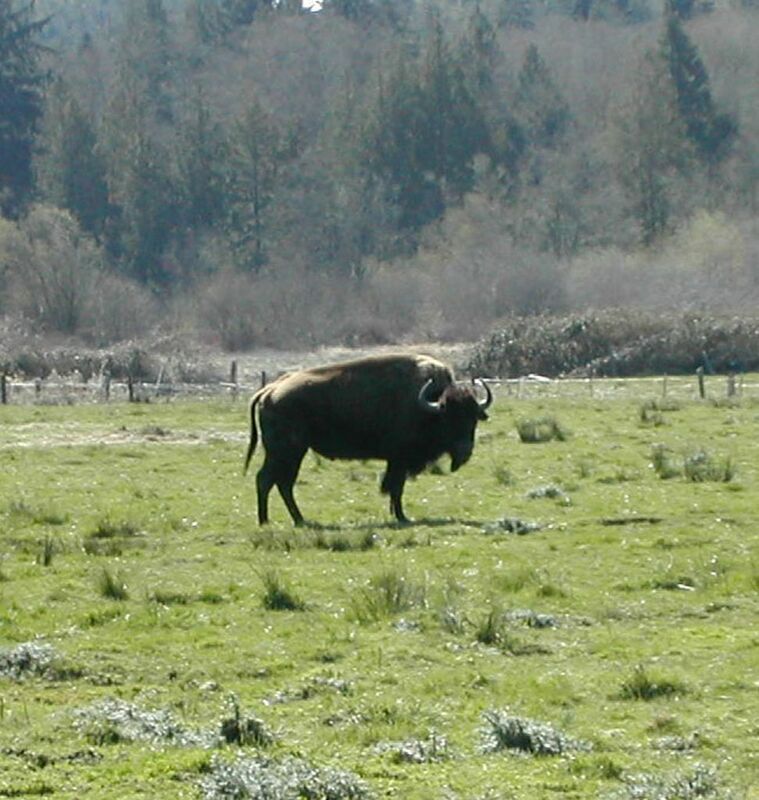 We photographed this beautiful bison (bison bison) just the other day. 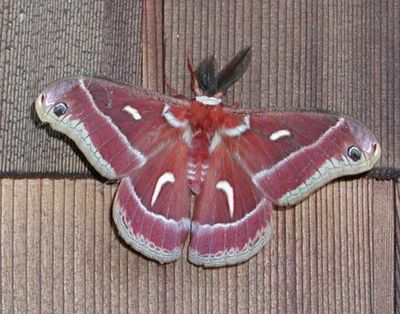 It's part of a small herd about 10 miles south of us. And for those of you wondering as I wondered: What is the difference between a buffalo and a bison? Here's what I found out. 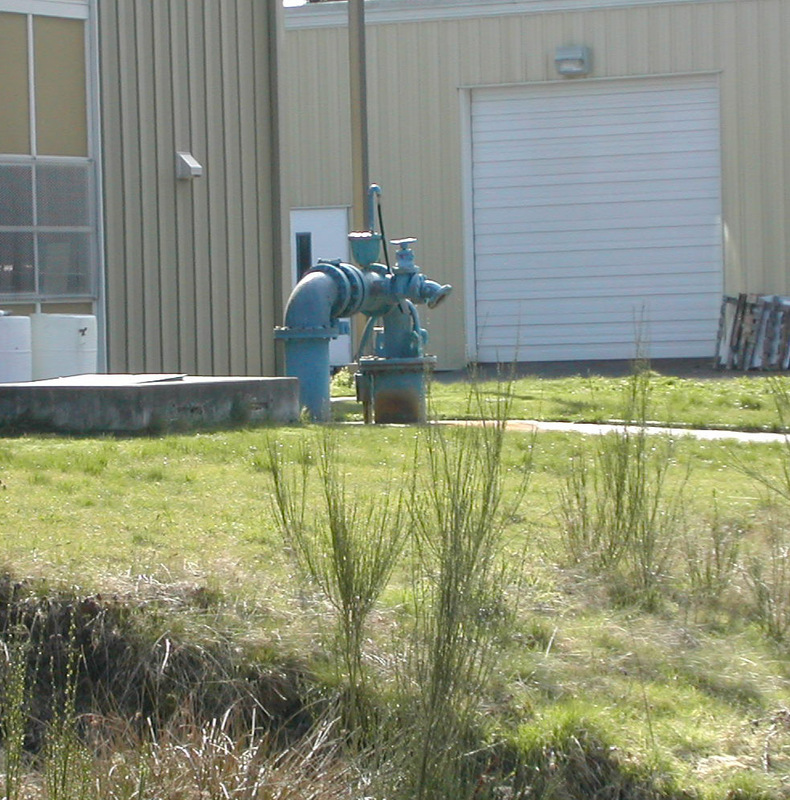 This is a picture of the well head, from where our public water flows. Fortune Magazine has touted water as the "best investment sector for the century." The European Bank for Reconstruction and Development has said that "water is the last infrastructure frontier for private investors." The Toronto Globe & Mail has stated that "water is fast becoming a globalized corporate industry." This news should send shivers down the spine of any concerned human being. I know that it certainly stops me in my tracks. Could our water supply be privatized? Could yours? The answer is a resounding yes. Recent laws have paved the way for for a larger private sector presence in our water supply. Whereas small or local public sector operators, such as city or county utility companies, used to control the market, now the big players of world business are getting involved. The magnitude of investments that will be required to continue to provide high-quality, reliable drinking water and wastewater treatment services to the nation is huge. A recent report from the American Water Works Association (AWWA) estimated the necessary investments in replacement of the nation's water infrastructure to be $250 billion over the next 30 years (AWWA, 2001a; this estimate is based on a water utility survey). Public officials with limited financial and technical resources are interested in alternatives that may help meet these needs. For the past two years, the small town of Felton, California has been fighting a battle to gain control of its water supply after it was acquired by American Water Works in Janaury 2002. Shortly after that acquisition, the German company RWE Aktiengesellschaft (RWE) the world's third largest international water provider acquired American Water Works and its subsidiary California American (Cal Am). When that acquisition was approved by the Public Utility Commission in December 2002, American Water Works (RWE) controlled water service for 2.6 million North American customers, including the 1352 customers in Felton who wanted control of their water supply. And so the battle began. The residents of Felton have learned that it is not easy to take back control of water supply, even with the neighboring water districts and the county Board of Supervisors on your side. 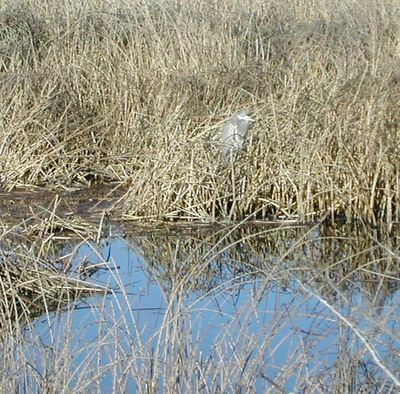 As recently as March 16th, Felton's efforts were rewarded when the county Board of Supervisors unanimously voted to begin establishing a special tax district to pay for buying the system owned by California American Water Co. and approved a preliminary plan that would issue about $11 million in bond debt to do it. Cal-Am officials had a succinct response. "The Felton water system is not for sale," said Steve Leonard, manager of Cal-Am’s coastal division, who called the move a potentially "costly blunder." They estimate the cost of Felton's water supply to be between $15 and $46 million. The Board of Supervisor will vote on April 26th to decide whether to continue with the battle. "The wars of the next century will be about water." This a quote from Ismail Serageldin, former Vice President of the World Bank, in 1999. The same World Bank that encourages the privatization of the world's water supply. Imagine if the Enron scenario happened with water. Water corporations exist to make profits-- not to preserve water's quality or affordability. The World Bank does not think that water is a basic human right, but a human need that can be fulfilled at a profit and allocated by the market. Paul Wolfowitz at the helm of the World Bank does not bode well for those of us who drink water and see it as a basic human right. The dread pirate just did a post on watersheds. Have you ever considered where your water comes from? How it is treated? Who owns the rights to it? Do you take your water for granted, even if it stinks like chlorine when it flows out of your tap? Do you think it will always be there, and some public sector employee will make sure of it? Who decides how much you should pay for your water? After all, it's water. It's not like you can live without it. What do you know about the water you drink, and the earth's supply of it? Here's a little background on the status of the earth's water. -About 70 per cent of all available freshwater is used for agriculture. Yet because of inefficient irrigation systems, particularly in developing countries, 60 per cent of this water is lost to evaporation or is returned to rivers and groundwater aquifers. -Water withdrawals for irrigation have increased by over 60 per cent since 1960. -About 40 per cent of the world's population currently lives in areas with moderate-to-high water stress. By 2025, it is estimated that about two thirds of the world's population -- about 5.5 billion people -- will live in areas facing such water stress. -More and more of the world is facing water shortages, particularly in North Africa and Western and South Asia. -Water use increased six-fold during the last century, more than twice the rate of population growth. -Water losses due to leakage, illegal water hook-ups and waste total about 50 per cent of the amount of water used for drinking in developing countries. - About 90 per cent of sewage and 70 per cent of industrial wastes in developing countries are discharged without treatment, often polluting the usable water supply. -Freshwater ecosystems have been severely degraded: about half the world's wetlands have been lost and more than 20 per cent of the world's 10,000 known freshwater species are extinct. -In areas such as the United States, China and India, groundwater is being consumed faster than it is being replenished, and groundwater tables are steadily falling. Some rivers, such as the Colorado River in the western United States and the Yellow River in China, often run dry before they reach the sea. -The task of carrying water in many rural areas falls to women and children, who often must walk miles each day to get water for their family. Women and girls also tend to suffer the most as a result of the lack of sanitation facilities. -At any one time, half of the world's hospital beds are occupied by patients suffering from water-borne diseases. -During the 1990s, about 835 million people in developing countries gained access to safe drinking water, and about 784 million gained access to sanitation facilities. One of the reasons the Dharma Bums moved to the Pacific Northwest was in consideration of the looming water crisis. Interestingly, we've just seen our first winter in Washington, and it was unseasonably dry. The state has already been designated in a drought. Here's something to ponder: What does Paul Wolfowitz and the World Bank have to do with water? We're going to try answer that in our next water post, but here's a hint: "Water promises to be to the 21st century what oil was to the 20th century: the precious commodity that determines the wealth of nations." the picture was taken this morning at 9:30 am. low tide was a modestly low +5.2. click on it for a bigger view. i am reminded by reading chris clarke at creek running north of an awareness invoked in me over thirty years ago by the naturalist peter warshall about knowing one's watershed. i lived then just outside fortuna ca in a small canyon just above a small creek. i never found a name for it but as the place was called picnic gulch on old maps i called it picnic creek. since then i have lived beside darkey creek (oh yeah, old names are not politically correct) in siskyou county, near soquel creek and then noble gulch creek , and then with carbonera creek thirty feet out the back door, all in santa cruz county. a creek that close is a decidedly mixed blessing; wonderful most of the year with ducks and myriad birds and a nice splashing sound trying to cover the freeway noise. it is also the animal highway for skunks and raccoons and in the winter can rise twelve feet above normal in a downpour, threatening what was left of the yard after disastrous floods in 1982 (before we moved there). now we live a quarter mile up a gentle slope from the lower reach of chimacum creek on the quimper peninsula in washington state. we can't hear or see it from our house of course, but then we will never be worried about flooding. there is a nice walk we often take that leads along the north bank of the forested canyon the creek runs through before emptying into port townsend bay, an offshoot of puget sound. 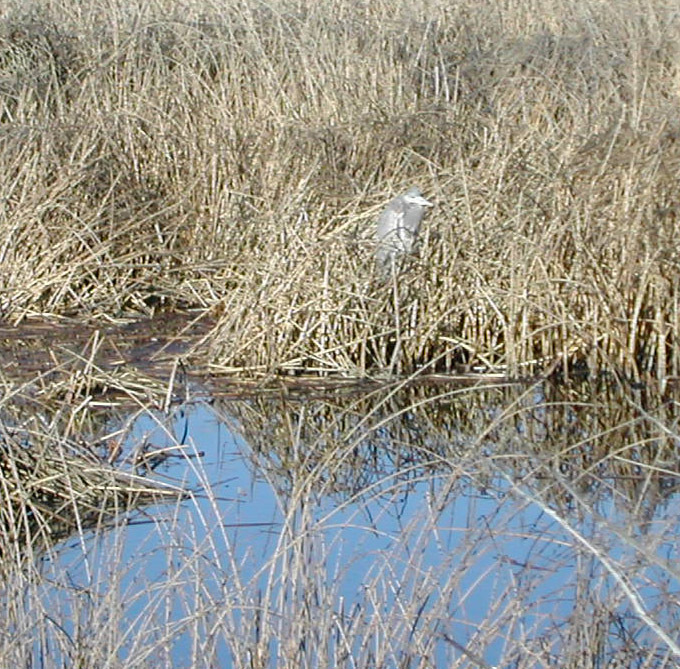 we see bald eagles, ducks, seagulls, lots of crows, and blue herons, which make a noise like a crow on steroids. 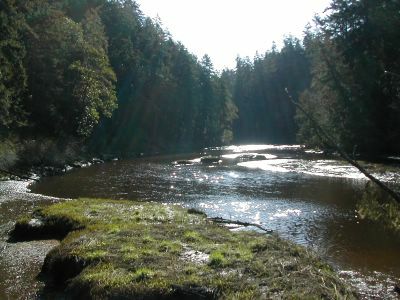 chimacum creek begins about 8 miles south of us and flows north (hi chris) through a shallow valley maybe 1/2 mile wide. it looks to be beautiful dark bottom land that is mostly pasture and hay, although there are vegetable gardens and one place with a cornfield. it turns eastward a mile south of us and is hidden in thick forest til it reaches almost sea level and flows through the most beautiful tidal estuary, still bordered by forest, at the bottom of a winding canyon. at low tide the creek is a shallow channel meandering through mud flats. at high tide, often eight feet above low, the estuary is an extension of the bay a half mile long, deep enough for people in rowboats and kayaks to paddle leisurely through. for another watershed piece go to sparkleberry springs. Looking for some fine reading? Go here The World Question Center. 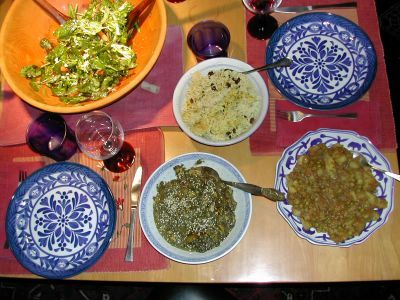 And thanks to Rosewood at tineleyspice.org for the link. A senator for all of this? We live in the rural northwest. Walk a 1/4 mile to the mailbox and back. Often see rabbits on the journey. Mushrooms and wildflowers too. Sometimes when we look up we see hawks, and on the rare occasion, an eagle. 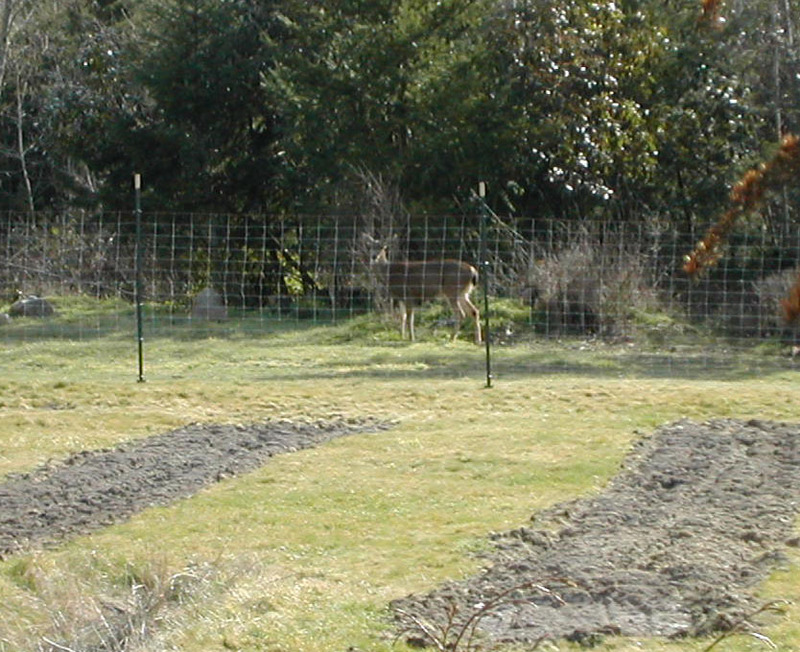 If there are deer they are only in the front yard, now that the fence seems to be working. I was climbing Glacier Peak in the Cascades of Washington several years ago on one of the clearest days I had ever seen. When we reached the summit of Glacier Peak we could see almost to the Selkirks in Canada. We could see south far beyond the Columbia River to Mount Hood and Mount Jefferson. And, of course, we could see Mount Adams and Mount Rainier. We could see across Puget Sound to the ranges of the Olympic Mountains. My companion, who is a poet, said: "You mean, there is a senator for all of this? Although there are enough senators to represent the interests of oil, banks, and pharmaceuticals. cooked in onions, garlic, and celery. good broth. 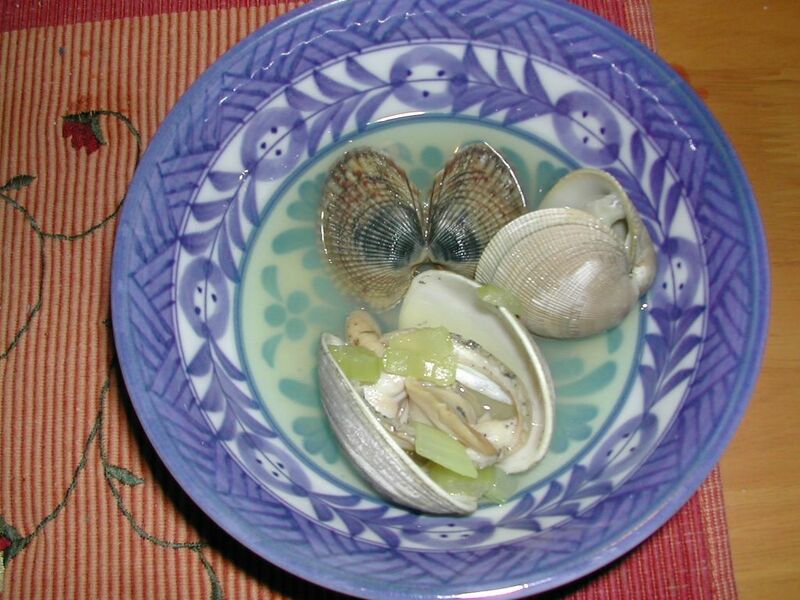 i first dug up a clam to take and cook and eat in 1971 in capitola, ca. i walked often between capitola and new brighton beach at low tide, the only time it was passable because high tide lapped at the bottom of 75 foot sandstone bluffs, to admire tide pools and their plants and animals. one day it occurred to me that there must be clams here. so i clawed into the gravel a bit with my fingers and sure enough got a clam. wow! took it home. cooked it. ate it. i liked seafood and thought it was wonderful that i could walk ten minutes and collect a few clams. so i went back some days later at low tide to claim my easy clams. digging in wet salty gravel with one's hands quickly wears away several layers of skin and grinds fingernails right on down. 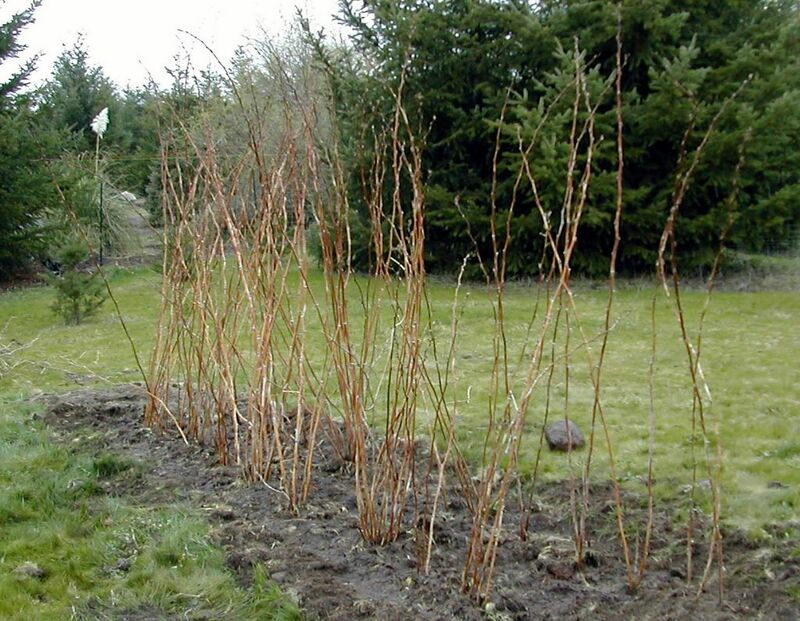 i found a three prong garden weeder that worked just right for the gravel, so i would dig maybe six clams several times a month according to tidal availability. 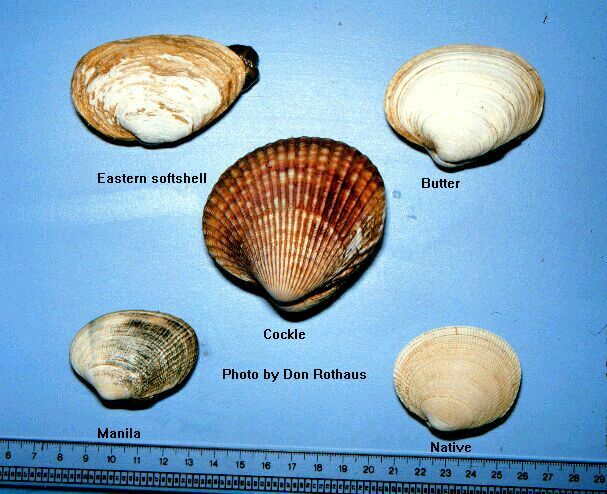 when i moved to san francisco i could barely see the ocean from my back room and walked to the shore quite often but never thought of clamming. then i moved to humboldt county and a friend from high school who lived there took me clamming to a place north of arcata called, appropriately enough, clam beach. i had only, though i knew of the wide range of types, actually dug up and found hard shell clams among rocks. clam beach at low tide was about 100 yards from beach to water and a half mile wide at least of flat sand--no gravel or rocks like i was used to. clams there are razor clams with thin, delicate shells. they hang out just below the surface of the sand. they can feel the tread of human steps and kind of swim down thru the wet sand at one's approach, after squirting up a bit of water. the strategy is to walk along watching for a squirt, quickly dig a garden spade in beside it, and pull back on the handle so as to compress the sand and trap the clam; then heave out the shovelful and look for a clam. after some practice we got good enough at it to harvest a bucketful between two or three of us in an hour or so. and it was great to be out there, often in fog. this is humboldt county. 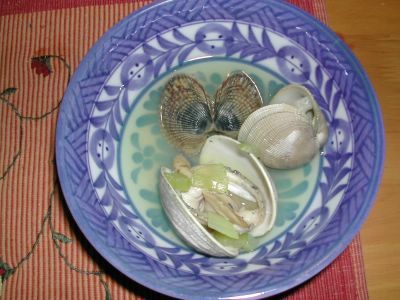 we had a clam feast maybe once a month. and i found new friends to clam with too. on the last clam expedition of 1973 we saw a few people using a new clamming device; a three foot long six inch diameter tube, open on the bottom and capped with a half inch hole in the cap, and handles. here's the drill. see a squirt. shove the tube down over it leaving the top hole open. cover the hole with a thumb. pull up the tube. remove thumb from hole and shake the contents out and get the clam. a two second process without digging that looked to be about 90% successful per try. there we were walking around with retrograde shovels heaving sand up and getting a clam maybe every third try on a good day. next year rolled around and clam time came and when we got to it i and two of my buddies went to clam beach with our shovels. uh oh. way too many cars. there is about 50 yards of scrub between the frontage road and the beach and we could see a lot of people out there. we started walking toward the beach. part way there we encountered a man carrying a gunny sack running toward the road. he saw us only when he was very close. he threw down the sack and blurted out "there's game wardens everywhere checking for licenses!" and ran on. the sack was full of clams. we picked it up and walked on out to the beach where we saw fifty gazillion people with the devil's own tubes. we exchanged wry looks and agreed that the clams didn't need us after them too. we did eat the abandoned clams. i thought my life of clamming was done. after some years i moved to siskyou county; well beyond an easy trip the shore. a few more years and i moved back to santa cruz county, i did pick up a few clams in capitola once or twice as well as admiring the fossils. now i live on the olympic peninsula in washington state. oh my. it is two miles to the mouth of a small creek where low tide uncovers the most marvelous mud flats just chock full of many varieties of clams. i went there to dig clams several times last year and twice so far this year and i have seen two other people digging only ONCE. and they used shovels. i use a garden hand trowel as my digging tool because my favorite clams are found 6 to 10 inches down. of course the clam dinner is not the only reward from clamming. the shore is endlessly interesting. all sorts of plants and animals besides clams live in the intertidal zone. when one looks up there are birds of all kinds. here in washington i often see bald eagles, and i watched a hawk scare a hundred crows off the mudflats. flocks of terns and shearwaters and birds whose names i don't know suddenly take off and fly around in wonderfully synchronous formations. bunches of various sizes of birds with long pointed beaks peck in the sand or mud for food. landward there are forested hills, sometimes coming right to the water's edge. and out there, always drawing my eye, is the huge expanse of the water. One day back in the winter of 1991, we went for a walk on the beach. We had walked this particular stretch of sand many times, but only at low tide, as it was inaccessible at high tide when the water lapped at the base of the cliffs. 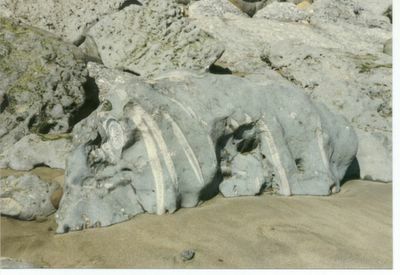 The walk between Capitola Beach and New Brighton runs along a cliff face that rises eighty feet above the beach and is striated with layers and layers of invertebrate fossils. In fact, it is so fossiliferous that it hardly drew our attention; it seemed so strangely commonplace. During minus tides we walked this beach for the tide pools -- always abundant with life-- crabs, anemones, starfish, octopus. On this particular day, after some powerful winter storms, the beach was entirely transformed. 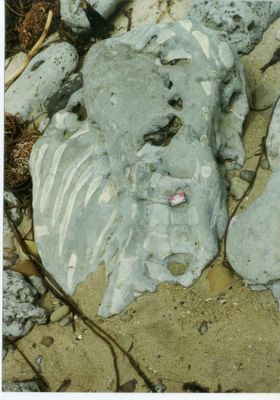 Much of the sand had been washed away, leaving large grey rocks exposed where the sandy beach had been. As we got closer to the rocks, we could see vertebrate fossils everywhere. We could hardly believe what had been under the sand all this time. Ribs and vertebrae as far as the eye could see. We knew the sand would eventually return and conceal these rocks again, so we returned the following day with a camera. These photos show some of what we saw. It was a couple of days or weeks later that most of the fossil bed was no longer visible. And all the years that we've gone back, we've never seen it like that again. In the mid- to late '90s, a group of property owners whose homes are on top of the cliff won approval from the City Council to form a Geological Hazard Abatement District to research and fund a seawall to protect their property from ongoing wave erosion. They were willing to bear the private cost of $2,000,000 to have a seawall constructed that would give their properties an estimated 75 to 100 additional years. The proposal called for a 1,257-foot seawall to be built along the base of the cliff. The structure, made of a material resembling a natural cliff face, would be 25 feet tall, with about 21 feet of it above ground against the 80-foot cliff. It would cover almost all of the paleontological record, in an effort to forestall the inevitable. The seawall proposal sparked a lot of interest in the paleontological importance of this particular stretch of beach. An Environmental Impact Report (EIR) was generated that described the beach, "a strategically important section of the Purisima Formation, containing faunas spanning from the late Miocene through the Pliocene epoch and representing differing environments, and is visible and accessible..."
The beds are highly fossiliferous, yet no definitive work on the unit was conducted until the 1970s. According to Frank Perry, Paleontologist and Research Associate, Santa Cruz County Museum of Natural History and the Monterey Bay Paleontology Society, scientific research on the fossils within the area is ongoing. Research has revealed that marine terrestrial vertebrates and marine invertebrates are known be be abundant in the coastal Purisima Fourmation and the rock exposures to be excellent. The vertebrate fossils include: dolphins, whales, seals, sea lions, bony fish, sharks, rays, birds, horse and an amphibian. Some of the marine mammals taxa are new to science. The invertebrate list includes fossil bivalves, gastropods, scaphopods, bryozoans, crustaceans, brachiopods, sea stars, sponges, and echinoderms. 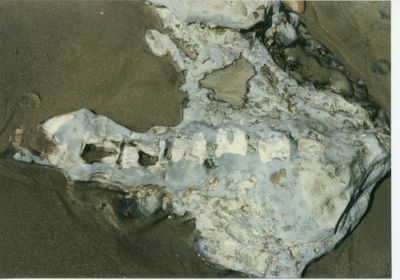 "The Purisima strata within the project site contain scientifically significant fossils and are rated very high to paleontological sensitivity. The Purisima Formation is the most complete late Miocene to Pliocene stratigraphic section visible along the central California coast, based on the visibility, accessibility, completeness, and the abundant, diverse, and extremely well preserved paleontological resources. 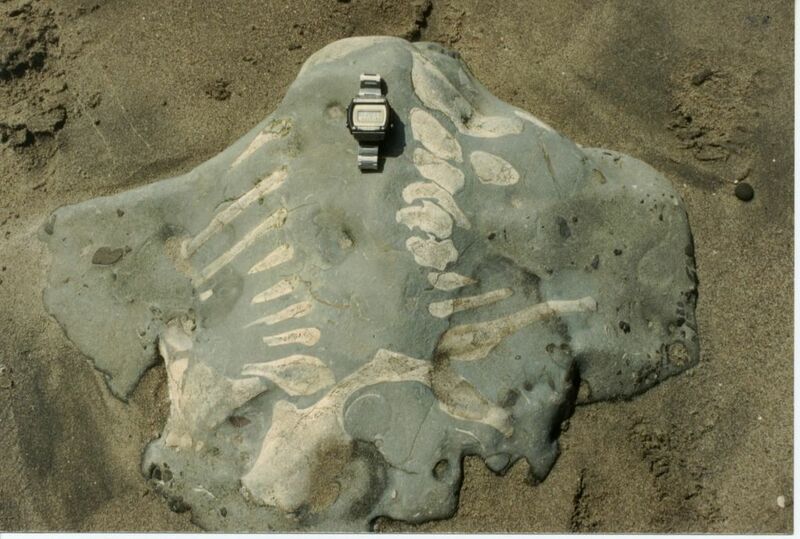 Vertebrate, invertebrate, and trace fossil materials are visible in outcrops and in deposits on the beach. Additional material may be visible periodically where tides are exceptionally low and/or sand/algae cover has been temporarily removed." The homeowners' seawall proposal was voted down in November 2004. A great victory for some very old bones. 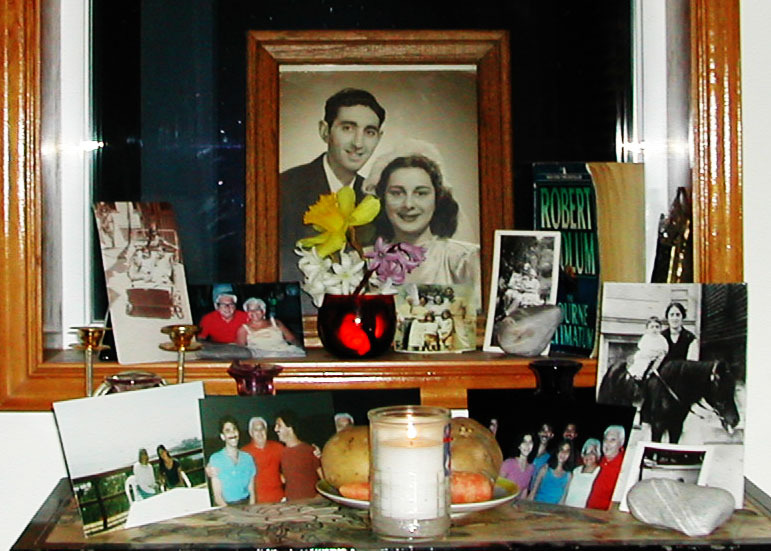 I felt the need to mark that anniversary by drawing on several different traditions -- burn a yahrzeit, build an altar, place stones on a grave, make an offering of his favorite things (photographs of his loved ones, mystery novels, food). So, an elaborate blending of multi-cultural ritual was conceived, and in the center the yahrzeit burned for 24 hours to mark that awful day. DPR and I took a dozen roses to the Capitola Wharf at Monterey Bay (where my father's ashes had been scattered), and tossed a rose in one by one and recited out loud how well my father was loved and remembered. Now, the planting has become part of the tradition. Every year in my father's memory I plant potatoes. Sometimes they are standard russets, sometimes yukon gold, or new red, or yellow fin, and once it was a lovely bunch of peruvian purples. Tomorrow, I will be planting potatoes again. the support pieces sticking up in the picture above are 3/8" rebar 5' long. they are attached to the wooden posts with fence staples. 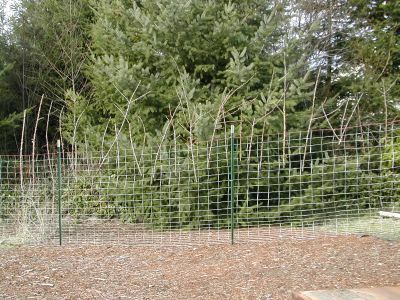 they are attached to the metal posts by sliding them through the top fence clip and adding fence wire as required to hold them. the string line is nylon carpenters twine in the gaudiest color available. we depend on visual intimidation. 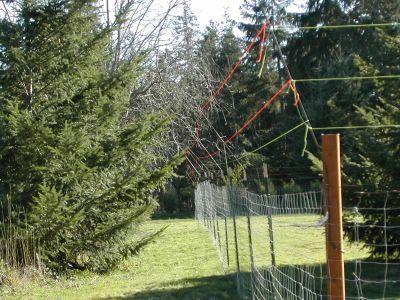 there is about 800' of fence, roughly half with vertical twigs and branches and half with horizontal day-glo twine. the top line is about 9' high. The closest I ever got to Jack Kerouac in spirit was to place flowers on his grave in Lowell, Massachusetts. The closest I ever got to him in life was to be with his dearest friends at a gathering in his honor back in 1982, during the 25th anniversary celebration of the publication of On the Road. It was a week-long celebration at Naropa Institute in Boulder, Colorado. Naropa has a Writing and Poetics Department called the Jack Kerouac School of Disembodied Poetics (begun by Allen Ginsberg and Anne Waldman in 1974), so a gathering of this sort was absolutely essential to the curriculum. I had just moved to Boulder and was looking to do something before I started classes at CU, so I volunteered to be the volunteer coordinator for this event. For months many of us joyously labored to gather all the old beat authors and bring them together to do readings, hold workshops, teach classes, and celebrate the life of Jack Kerouac. Quite a gathering it was-- Allen Ginsberg, William Burroughs, Lawrence Ferlinghetti, Ken Kesey, Gregory Corso, Abbie Hoffman, Tim Leary, even the obscure characters from Kerouac's books like Herbert Huncke, Carl Solomon (to whom Ginsberg's Howl is dedicated) came. Jan Kerouac, Jack's daughter, was there, as well as Neal Cassady's widow, Carolyn. What an occasion. 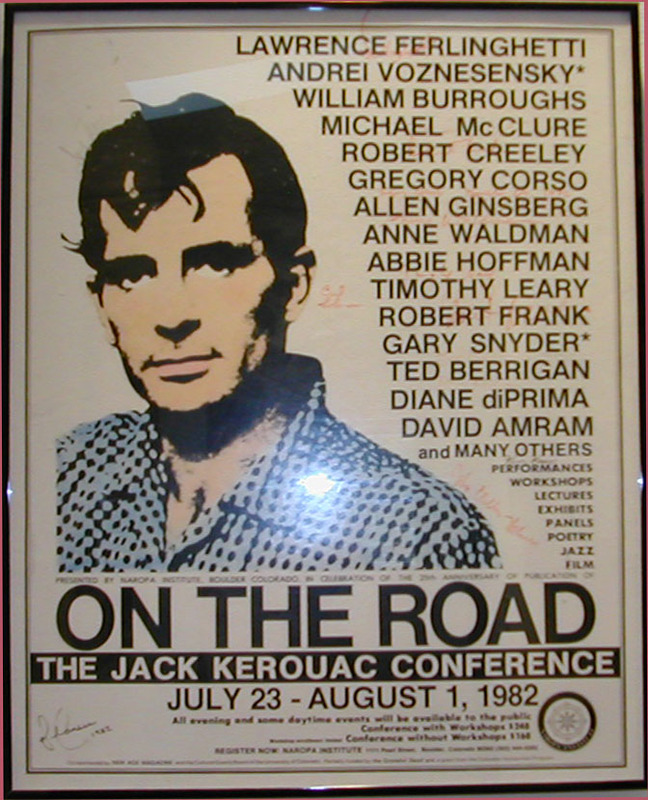 Kerouac was truly honored by those who knew and loved him. They read his words, they sang his praises, and we raised our glasses in his honor. Most of his life was spent in the vast landscapes of America and with the people that live among them. Faced with a fast-changing America, Kerouac sought to find his place in this climate and tried to effect a change, bringing him to reject the values of the fifties that celebrated growing consumerism and the new suburban lifestyle, among many other things. His writings actually often reflect a profound desire to break free from society's mold and to try to find a deeper meaning to life, which eventually led him to start experimenting with different drugs (he once tried psilocybin with Timothy Leary), to study spiritual teachings such as those offered by Buddhism, and to embark on numerous trips throughout the world. His books are also sometimes credited as having contributed in sparking the counterculture of the 1960s. "The only people for me are the mad ones, the ones who are mad to live, mad to talk, mad to be saved, desirous of everything at the same time, the ones who never yawn or say a commonplace thing, but burn, burn, burn, like fabulous yellow Roman candles exploding like spiders across the stars and in the middle you see the blue centerlight pop..."
Jack Kerouac would have been 83 years old today, if he hadn't burned that candle out at 47. 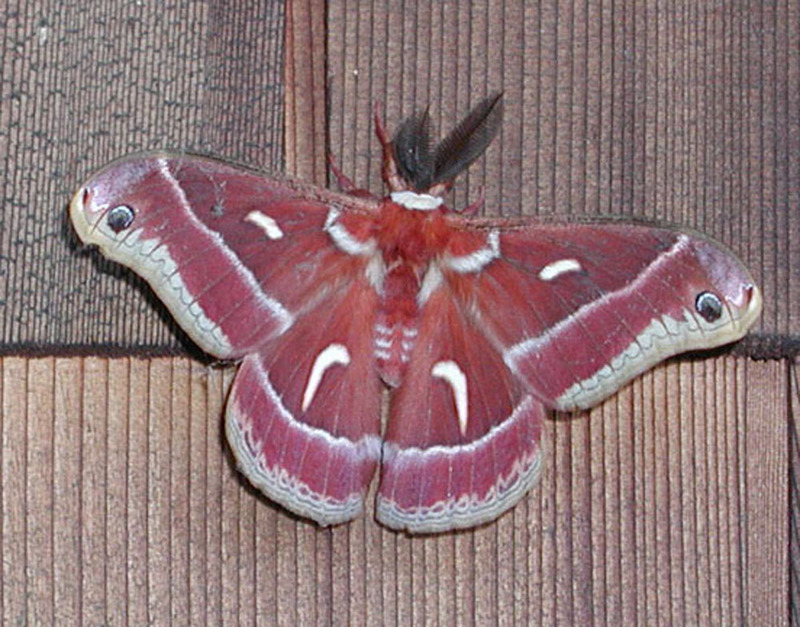 We found this Ceanothus Silkmoth at UC Santa Cruz last year. have you had a mystical experience? just what is that? here are some descriptions from a book by Paul Davies titled "the mind of god" and subtitled "the scientific basis for a rational world." these descriptions of the mystical experience are all necessarily from others as Davies ends his book by saying that he has never had a mystical experience. "the language used to describe the experiences usually reflects the culture of the individual concerned. western mystics tend to emphasize the personal quality of the presence, often describing themselves as being with someone, usually god, who is different than themselves but with whom a deep bond is felt. there is, of course, a long tradition of such religious experiences in the christian church and among other western religions. 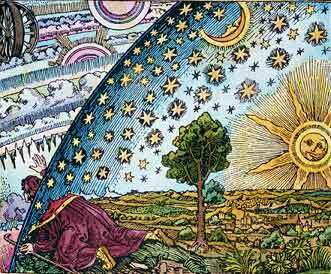 eastern mystics emphasize the wholeness of existence and tend to identify themselves more closely with the presence." without claiming wisdom, i can say that those descriptions work for me, and that despite my western upbringing my own experiences were of the eastern type. i felt myself to be a mere drop in the ocean of oneness, but definitely a part of it and not apart from it. the trace of those experiences that remains is a sense of connectedness with everything but most strongly with the natural world. thus it is rational for me to seek a universalist ethic and do my best to live up to it. In a fit of unrestrained enthusiasm I sent links to two of my posts to Tangled Banks, an online magazine devoted to science. They were both accepted for the latest issue! Tangled Bank is being hosted this week at Living the Scientific Life, so please go and check it out. "Live from Gibbon, Neb., and I mean live. Some heavenly gong that only birds can hear has sounded, and thousands of sandhill cranes are taking off from the Platte River. Anyone on the Internet can see this amazing migration in real time, thanks to National Geographic's "crane cam" (nationalgeographic.com). You have till April 17." If you like to watch cranes, absolutely take a look. And a friend sent this link to a site in San Francisco where a camera has been set up to record peregrine falcons. We're thinking we should invest in a really good pair of binoculars. Anyone have any suggestions? And, has anyone tried the binoculars that have digital cameras built in? This spring is our first planting season in Washington. 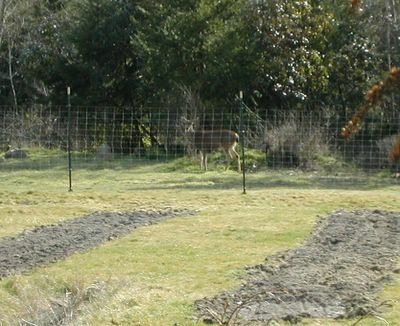 We put up fencing in anticipation of the deer problems we know will have. 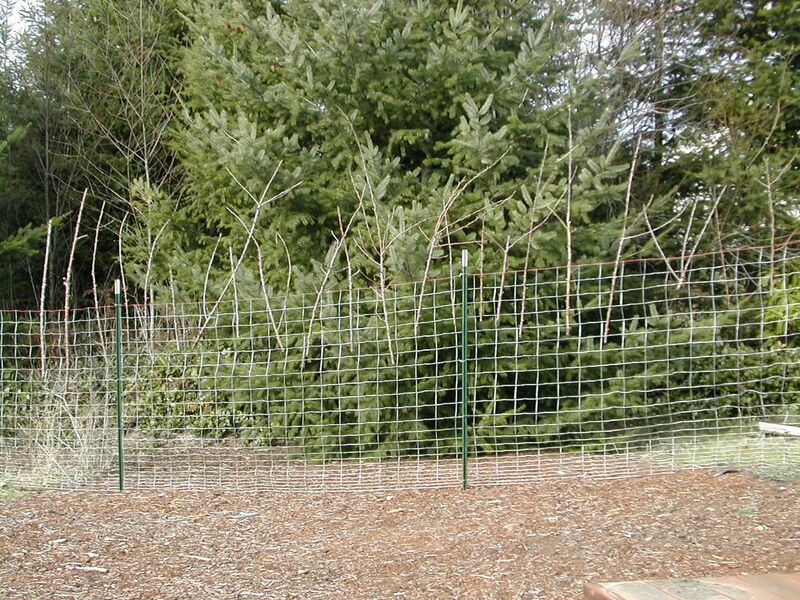 Some friends told us about adding irregularly spaced and sized extensions to the fence as a real deterrence. We started on one side of the yard, but haven't completed the project. This morning we had our first deer encounter of the spring. So far so good. Salad from our friend Jane. i am just finishing a book by Paul Davies called "The Mind of God" wherein he says about mystical experiences that ".....western mystics tend to emphasize the personal quality of the experience, often describing themselves as being with someone, usually god......"
"Eastern mystics emphasize the wholeness of existence and tend to identify themselves more closely with the presence." heat the oil, put in whole seeds, ten seconds later add tomatoes, coriander, cumin,turmeric, and garam masala. cook till water is gone. add the rest. simmer for 20 minutes. tastes much better if allowed to sit for a while and reheated. even better tomorrow. quite easy as we have an electric rice cooker. put this stuff in a food processor and pulverize it. put some coconut milk in a small bowl, add 1/8 tsp THAI brand red or green curry paste (this stuff is hot)and mix together. add to pan. put a bit more coconut milk in the bowl and set aside for heat adjustment later. after it cooks for a while taste it. more salt? if it is hot enough just add the set aside coconut milk. if it wants to be hotter add a bit more curry paste to the cocnut milk, blend and add to pan. cut a small package of tofu into smallish cubes and saute in a frypan or wok in peanut oil till golden brown. add to curry sauce. serve over rice. We live in one of the most peaceful looking places in the country. The expanses of water, the mountains in the distance invoke a feeling of serenity. 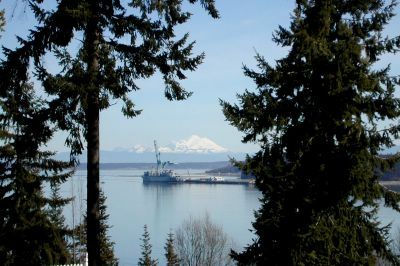 This photo was taken about a mile from our house, looking at Indian Island Naval Magazine, where war ships come to load supplies (ordnance, ammunition). On our way into town the other day, where the road rises to a hilltop and Puget Sound comes into view, we saw a nuclear submarine making its way to Subase Bangor. It was the first time we had seen such a thing in these waters, but know that trident subs move about fairly often. The military is the largest single employer in the state of Washington. Oh, that's Mount Baker in the background. Sure is pretty, isn't it? I love Lucy. It's true. I am smitten. 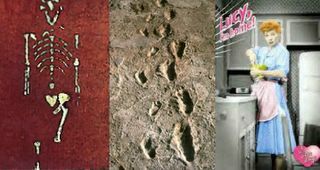 I have been ever since Lucy's bones were discovered in Afar Ethiopia in 1974, and she flashed onto the evolutionary scene a namesake of John Lennon's Lucy in the Sky with Diamonds. Little Australopithecus Afarensis, such a tiny thing. Oh, but her presence, walking upright and therefore profound. I don't know how the whole "bones of contention" controversies will ultimately work out-- whether we walked out of Africa two million years ago, and populated the planet, or if we are truly descended from one "eve" of 200,000 years ago whose contemporaries supplanted all other proto-humans on the planet, based on evidence in our mitochondrial dna. I still love Lucy. I love the fact of her. I love these footprints in the volcanic ash. What else could they leave behind 3.5 million years ago? Only their bones wedded to stone, their teeth still anchored securely in their ancient jaws. What more could they have done? They left us accidental time capsules, as surely as we leave rock 'n roll records and newspapers. We were here, they say, we were here. I Love Lucy: A televsion show from the 50s, and a strange electromagnetic calling card we are sending out into the universe. As a planetary civilization, we have been emitting television signals for just over 50 years, radio signals for less than 100 years. So the electromagnetic "signs" of our civilization (the only kind that will travel so far and so fast) have gone outwards into the Milky Way only 100 light-years or so at most, just 1% of the total area of the Milky Way. And it's really only since after World War II that we've been sending out signals in a huge volume, using much of the electromagnetic spectrum, so that random searching of that spectrum would very likely "find" a message on it. Thus only approximately 1% of the Milky Way can "hear" us so far, assuming anyone is listening. We haven't even begun to have our electromagnetic signs reach any other part of the universe, such as the Andromeda galaxy. But we will. And what will we be transmitting besides sitcoms, talks show, and reruns of old movies? Well, there's always our pictures of Shock and Awe, Alberto Gonzales testifying before congress, and all the other mayhem our species can muster. We are leaving our calling card as surely as our ancestors left their bones. Hello, hello. Lucy is calling.